About 3.6 million years ago a small group of bipedal hominids walked across a thin layer of volcanic ash on a sandy surface in what is now Laetoli in Tanzania. Their tracks were preserved by a second layer of volcanic ash, that later turned into a cement. In 1976 these footprints were discovered by a team of paleontologists led by Mary Leakey. The actual find was made by Andrew Hill (original Nature paper here). The chances of the above sequence of events happening are remote. To say the least. The discovery of the Laetoli footprints are an outstanding example of the power of simple scientific observation. There was no need for any of the high-tech gizmos associated with modern high-energy physics. No GPS. No fancy computer analysis. There was no 'experimental design' as the events were a one-off. These footprints were recorded by a team of scientists and field workers who were diligently working in blistering heat, notebook in hand. They found the footprints by looking through the blinding glare at the sandstone or tuff surface of the ground. It is a lovely example of the power of intense seeing. The discovery of the Laetoli footprints does not answer any of the fundamental questions about nature that big experiments like the Large Hadron Collider do. Nevertheless, from a parochial human point of view, these footprints and what they imply are probably more fundamentally important. Over the past 40 years this set of footprints have continued to be of keen interest to a wide range of scientists who are seeking to understand how humans evolved from ape like ancestors via bipedal hominids. These results provide us with the earliest direct evidence of kinematically human-like bipedalism currently known, and show that extended limb bipedalism evolved long before the appearance of the genus Homo. Since extended-limb bipedalism is more energetically economical than ape-like bipedalism, energy expenditure was likely an important selection pressure on hominin bipeds by 3.6 Ma. Figure 1. 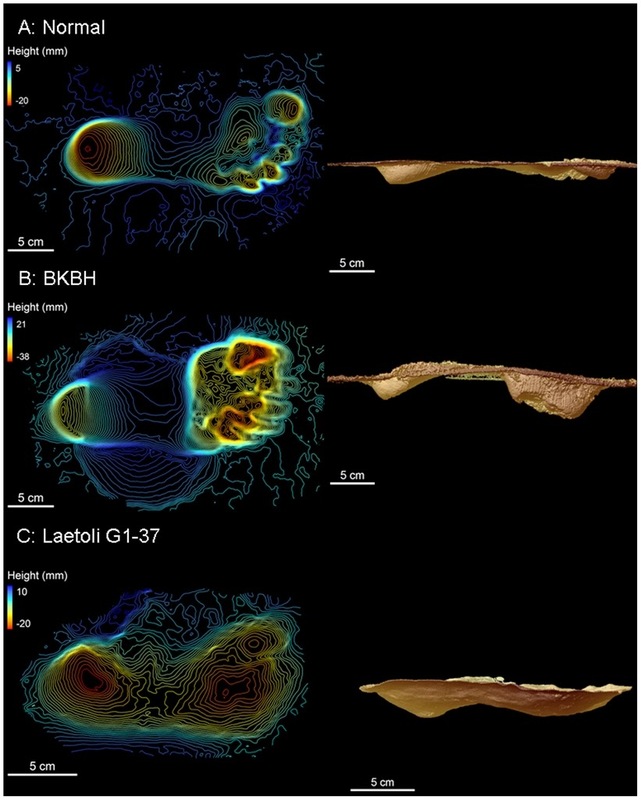 Three dimensional scans of experimental footprints and a Laetoli footprint.